We will be demonstrating our popular height-adjustable Gemini bath at the next Occupational Therapy Adaptation Conference (OTAC). OTAC, Hallmark Hotel, Bar Hill, Cambridge, CB23 8EU. 13th June, 9am – 4pm. Stand 05. OTAC events deliver invaluable insight regarding housing adaptations and opportunities to see the latest assistive equipment. The latest Cambridge conference will offer benefits to Occupational Therapists, commissioners and construction professionals working in the housing sector, such as surveyors and architects. There will also be a comprehensive seminar programme and CPD-accredited training. 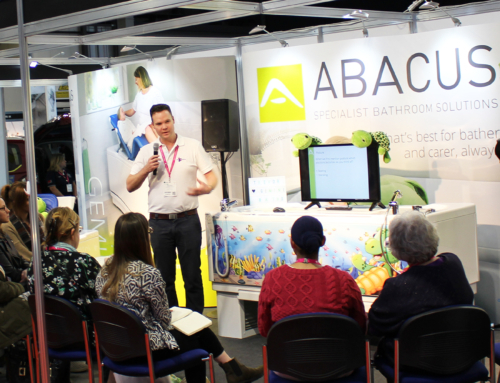 Part of the Gainsborough Healthcare Group, Abacus works closely with healthcare professionals, care providers, families and specifiers to deliver the best accessible bathing solutions – from specification and manufacture through to install and after-sales care. Our highly-regarded range of specialist baths provide safe working heights for carers and allow bathers to enjoy a safe, pleasurable bathing experience. The proven and reliable Gemini on stand 05 is a leading choice for OTs and families due to its integrated changing, drying and bathing platform. Its unique double lift action removes the need to manually lower and raise a disabled bather in and out of the bath and reduces the number of transfers. This helps to keep the bather warm and comfortable during the changing and drying process and eliminates potential back injury for carers.